I've spent the last month writing and rewriting another picture book manuscript that has yet to have a title. It stars Jack the dog, a character from my first self-published picture book from two years ago. Now that I have a final draft, I am now ready to search out a publisher. I've got five publishers lined up to send the manuscript out to. Since last February, I have been in talks with a writer/director of horror films who has been helping rewrite my horror script. An email from him a month or so ago, advised me to seek out an agent. So that's what I'm in the process of doing. This week I will be sending out query letters and I can't wait to see what turns up! I recently became a featured writer for Starburst magazine and continue to freelance for my usual publications. Though sometimes I feel as though I have taken on too much as far as trying to juggle a freelance career and an author. I feel I'm failing at finishing my YA novel, "Blood Pressure," and keep telling myself that I will finish a first draft by this fall. I hope so. 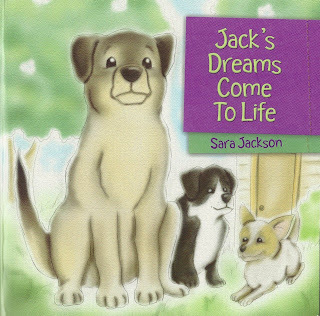 Below is my first published picture book, "Jack's Dreams Come To Life." Failing to find mischief on his ranch, Jack falls asleep under his favorite tree. His dreams, which include a giant squirrel and squeak toys that come to life, provide him with more trouble than he can handle.